I admit I came across this totally by accident but what a sight to see at the centrals piers in Hong Kong. Over 30 Lamborghini super-cars parked nose to tail and 3 abreast as a prelude to a drive around Hong Kong Island. 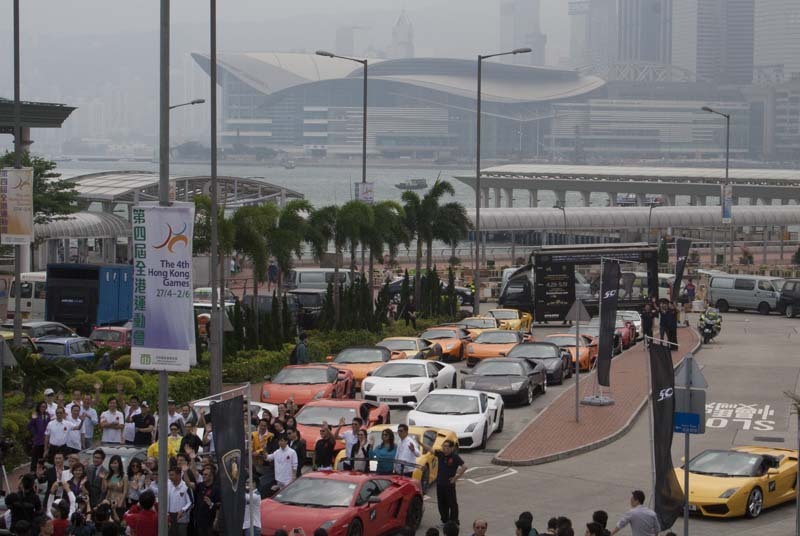 The gathering of Hong Kong Lamborghini owners was organized to celebrate the car makers 50th anniversary this year. The grouping was also attended by the director of Lamborghini Hong Kong, Albert Wong. The group left the Central piers area in a convoy that began a procession around Hong Kong Island. This drive was a precursor to a similar event planned in Italy in May for the official factory recognized Anniversary drive across Italy. The drive will cover roughy 750 miles and starts in Milan on May 7th. stops include Forte di Marmi, Rome and Bologna before concluding at the firm’s headquarters and manufacturing facility in Sant Agata Bolognese on May 11th.